In the 1930s, a dentist in California named Charles Pincus created the first dental veneers. They were designed to be used in the making of Hollywood films, helping actors and actresses get the smile looks they needed for various roles. Soon after, porcelain veneers were being used by cosmetic dentists to makeover everyday American smiles, and cosmetic dentistry was born. Dr. James Feigenbaum and Dr. Jenna Feigenbaum continue the tradition of using porcelain veneers to fix numerous smile problems at our Creve Coeur, MO dental office. Today, porcelain veneers help patients with a variety of problems find cosmetic relief and improved self-confidence. Patients with crooked teeth, gaps, chips, stains, worn teeth from teeth grinding, and other problems can be candidates for porcelain veneers at our Creve Coeur cosmetic dentistry office. 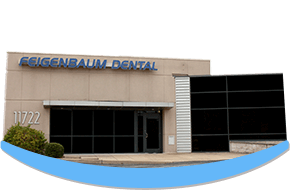 You’ll spend an hour or two at Feigenbaum Dental during your initial visit. To help our dentists get an idea of the changes you want to make, feel free to bring photos of celebrity smiles you want to emulate, and be prepared to discuss all of the imperfections you’re hoping to cover with porcelain veneers. You’ll get to have input on the shape and color of your porcelain veneers, so make sure you know what your preferences are. Once you and our dentists have thoroughly discussed every aspect of your porcelain veneers treatment, we’ll prepare your teeth for the veneers by removing a tiny bit of enamel. Impressions will be made of your prepared teeth to be sent to the dental lab, and you’ll wear temporary veneers between this initial visit and the return visit for placement. Your porcelain veneers will be created at a custom dental lab. These hand-crafted pieces of tooth-shaped porcelain will be made to look like natural teeth, using your specifications as a guide. This process will take a couple of weeks, after which time you return to Feigenbaum Dental in Creve Coeur, MO to have your porcelain veneers bonded permanently to your teeth. Our dentists will place your porcelain veneers and make sure they fit comfortably, modifying them if necessary for fit, style, and function. With a lot of experience in cosmetic dentistry, Dr. James Feigenbaum and Dr. Jenna Feigenbaum will not consider your case finished until you’re completely satisfied. We invite you to visit Feigenbaum Dental in Creve Coeur, MO to learn more about what porcelain veneers can do for your smile. We’ll help you decide the best possible cosmetic dentistry treatment for you and perform the entire makeover from start to finish at our Creve Coeur area dental office, making smile makeovers convenient for patients from Maryland Heights, Town and Country, and all over Creve Coeur. Contact us for an appointment!